Wedding Photos: Throw and catch the flower..!!! Flowers throw and catch moment is the second if not the most important photo shot in a wedding. When I was on a wedding photography job, I am in high alert and attention when the bride is throwing the flower bouquet. Most wedding like to do this but some didn’t because they dun want to break the rented flower bouquet. 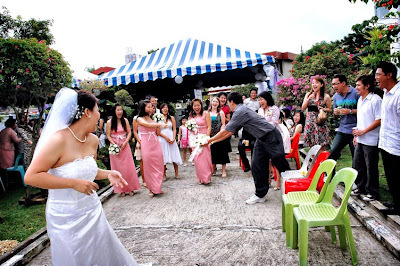 It is a great photo opportunity for the wedding photographer if the bride decided to throw the flower bouquet. To shoot this fast and quick moment, one need to use a dSlr camera multiple frame shoot. Point and shoot camera not suitable because of the slow shutter capture. Here, I would like to share few selection of this photo because it is what wedding photo journal is about. Update: A copy of this post was sent to JPG Mag website to enter vote. Please vote yes if you like it.